Civilization has reached a critical threshold. Whether life continues to evolve or devolve depends upon our ability to reach higher states of consciousness en masse. This requires calling upon the transformative power of the soul—a power not handed to us, but earned. We are living proof that the physical and spiritual realms of existence work together in unity. Yet for many of us our natural soul light and inner spiritual intuition are suppressed due to the distractions of day-to-day living and the electromagnetic pollution of our screen-filled technological world. In this exploration of the multidimensional interplay between the body, mind, and spirit, Carrie L’Esperance reveals how we can restore the flow of spiritual light in everyday living through the art of self-mastery. She explains how technology has severely reduced humanity’s natural abilities and spiritual power. She shows how EMFs and wi-fi toast our energetic bodily systems and suppress our immune systems, blocking the ethereal frequencies of light and suppressing our creative intuition and higher powers. Detailing the spiritual bio-geometry of light and the holographic principle, she explores how the cells of our bodies receive light’s deeper vibratory frequencies to support conscious evolution and soul development as well as explaining near-death and out-of-body experiences. She identifies the dissonant energies that endanger mind/body health and reveals new advances in brain science that allow us to transcend the malign influences that hamper human evolution. She provides exercises and techniques for spiritual alignment and receptivity, including psychic cleansing, physical and emotional detox, chakra and aura strengthening, and oracular dreaming. Civilization has reached a critical threshold in time unlike any other. Whether life continues to evolve or devolve depends upon our ability to reach higher states of consciousness en masse. This requires calling upon the transformative power of the soul--a power not handed to us, but earned. We are living proof that the physical and spiritual realms of existence work together in unity. Yet for many of us our natural soul light and inner spiritual intuition are suppressed due to the distractions of day-to-day living and the electromagnetic pollution of our screen-filled technological world. In this exploration of the multidimensional interplay between the body, mind, and spirit, Carrie LEsperance reveals how we can restore the flow of spiritual light in everyday living through the art of self-mastery. She explains how technology has severely reduced humanitys natural abilities and spiritual power. She shows how EMFs and wi-fi toast our energetic bodily systems and suppress our immune systems, blocking the ethereal frequencies of light and suppressing our creative intuition and higher powers. Detailing the spiritual bio-geometry of light and the holographic principle, she explores how the cells of our bodies receive lights deeper vibratory frequencies to support conscious evolution and soul development as well as explaining near-death and out-of-body experiences. She identifies the dissonant energies that endanger mind/body health and reveals new advances in brain science that allow us to transcend the malign influences that hamper human evolution. She provides exercises and techniques for spiritual alignment and receptivity, including psychic cleansing, physical and emotional detox, chakra and aura strengthening, and oracular dreaming. 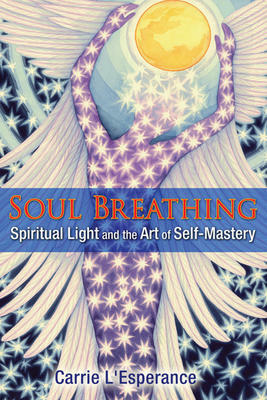 Preparing us for the new cosmology and the greater community of worlds that is being revealed, LEsperance shows that when we are properly connected with our souls intelligence and cultivate the reception of higher frequencies of consciousness, then we are able to soul breathe, to absorb more pranic energy, the electromagnetic force and cosmic radiation that is the sustaining element of all life and consciousness.